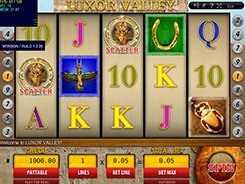 Luxor Valley is an Ancient Egyptian themed slot equipped with 5 reels and 9 paylines. 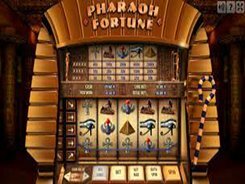 On the reels, you may come across the following symbols: classic playing cards from 9 to Ace, a scarab, a horseshoe, the goddess Isis, Cleopatra, and the Pharaoh Mask. By adjusting the number of active paylines (up to 9) and a line bet ($0.1 to $5), you may place a stake anywhere from $0.1 to $45 per spin. The developer decided to combine the functions of a wild and scatter in a single symbol, the Pharaoh Mask. When acting as a wild symbol, the Pharaoh Mask substitutes for other icons and helps complete winning combos. As a scatter, the Mask awards a payout of up to x1800 times a bet if three, four or five of them occur in any position on the reels. 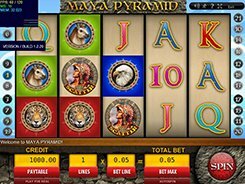 Furthermore, 3+ Masks landed anywhere trigger 10 free spins. In Luxor Valley, wins are paid if you get a match of two themed symbols or three card symbols. The first and second largest prizes up for grabs are 5000 coins ($25,000) and 2000 coins ($10,000). PLAY FOR REAL MONEY!